We offer the largest range of Fine New and Vintage jewellery catering to every budget. Over 70% of the jewellery we sell is NEW, and 90% of this is proudly Australian-made. We sell a range of unique and beautiful Diamond Engagement Rings, Diamond Solitaires and Dress Rings, Gold Bangles, Gold Chains, Pearls, Fob Chains, Gate Bracelets, Padlock Bracelets, Marcasite, Antique pieces, Curios and much more. Our certified appraisers can provide written photographic valuations for jewellery collections, and we offer a complete insurance quotation and replacement service. We buy jewellery and gold of every description, large or small amounts, diamond and stone-set and even broken items, including scrap gold. We can pay you cash on the spot, or you can trade your items towards another piece for an extra-special price. 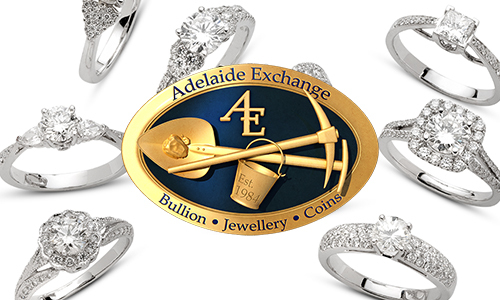 Remember, Adelaide Exchange, as a jewellery re-seller, can offer you a higher price for your re-saleable items of jewellery, not just rock-bottom metal price. We can provide valuations for complete jewellery estates, and probate requirements. We buy and sell all Australian and world coins, banknotes, gold and silver. As official agents for the Royal Australian Mint, we sell a select range of uncirculated and proof coins. We also carry an extensive range of Royal Australian Mint issues from past years. We stock a competitively priced range of both pre-decimal and decimal Australian coins and banknotes, as well as an interesting range of world collector coins.